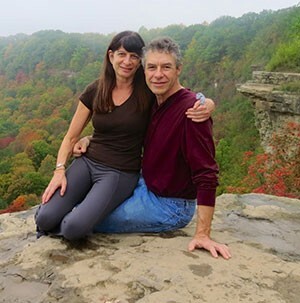 Th3 2014 Community Campaign got a boost with a $40,000 challenge gift by Lawrence Yanover and Frances Cohen in honour of his parents, Paul Hanover and Helen Yanover, and their long-term commitment to the Hamilton Jewish community. The gesture was meant to inspire others to step up to higher levels of giving. It’s not something this community is accustomed to seeing: That a professional couple in their late 50s would make a signficant financial gift to the Community Campaign flies in the face of the current wisdom that says today’s Jewish professionals are not likely to donate to the Campaign at the same level of yesterday’s entrepreneurs. Below, Yanover, a pediatric dentist, born and raised in Hamilton, explains how he and his wife, Frances Cohen, a primary school teacher originally from Montreal, arrived at their decision. You’ve been a big supporter of other causes, such as the Dundas Valley School of Art. Why did you choose to support Federation’s Community Campaign in such a significant way? When you look at communities like Mississauga and Oakville and compare them to Hamilton that has multiple synagogues, day schools, a ritual bath and a kosher butcher shop, you have to realize that we have a remarkable community. I believe that every aspect of our Hamilton Jewish community is touched by the Federation and that’s why I made the donation to the Federation. Yves (Apel) defined where he wanted the campaign to be, and since I’m on the campaign cabinet, I bought in to what he was saying because I’m a believer in the Federation. I’ve been active in the Federation for many years, and I thought his goals were attainable and that it was time to step forward, I had the ability to do it and now was the right time. We all come across those situations in our lives when we ask ourselves, ‘if not now when? If not me, then who?’ Thankfully, I have a successful profession and I have the ability to make these donations. How did you come to choose to donate through a matching gift program? We wanted to move the community up a notch and this was a way of providing a leadership donation that would hopefully inspire others to make a bigger commitment to the Federation. We’re hoping to have a snowball affect with this, because I believe that there are a lot of people in our community who have the resources to be more generous to our Hamilton Jewish Federation. How did your family’s long history in Hamilton inform this decision? I was in the Adas Israel one day when Rabbi Morton Green showed me my grandfather’s name on a monument. He told me that my grandfather was was one of the big donors to the city’s orthodox shul and I couldn’t believe it. My grandfather sold fruit door to door to support eight kids and he did not lead a wealthy life, and yet, he made a significant commitment to this community. My father, too, has made financial as well as many other types of commitments to the community. My parents taught me that charity was an important part of what you have to do as a person. I’m of a certain generation that’s seen what this community can do and what it once was. And I believe that it can be that again. Were there any other factors at play in making this decision? I work with poor people all the time, as does Fran, so we’re both very sensitive to the fact that there’s a lot of need out there. There’s a recent study that came out that shows the wealthier people are, the less of a likelihood that they will come into contact with the less fortunate. Unless you choose to work with those communities, you don’t see what the needs are. Fran and I decided that we have enough of all the things that we want and that it was important to help others in more difficult situations. I think that 30 or 40 years ago, more people dug deeper. And I’m not seeing so much of people doing that anymore and it bothers me. We are a remarkable community, but (to maintain that ) each of us has to look into ourselves and say, ‘are we able to help to move this forward?’ I know there are those who have the resources but haven’t asked themselves that question yet. Charity’s just not on their radar. It’s sad because there’s a lot of need out there… and I’ve seen how giving people a hand up has made a world of difference. The key thing is to actually stop for a moment and ask, ‘what resources do I have and how can I make those resources help other people?’ We live well, many of us, and we have to step up to help others that aren’t as fortunate.